The college football season is in full swing. Finally. I love college football. I can watch college football for hours. Pro football, not so much. The first weekend was as expected. Most teams scheduled cream puffs and walloped them. There were a couple of surprises (I’m talking to you Ole Miss) and a few real tests between equal opponents. Boise State triumphed over Virginia Tech on Monday. The Broncos are likely going to remain in the National Title picture for a while. Utah pulled an upset early in the weekend when they knocked off Pittsburgh and Hawaii hung quite a few points on USC in a losing effort the same evening. Not to mention, UB shut-out Rhode Island in their home opener under new coach Jeff Quinn. And that was just Thursday. My boys in Tallahassee rolled up big on their cupcake, Samford, joining just about every other perennial powerhouse in taking on an inferior opponent to make the home fans happy in week one. Notre Dame and Brian Kelly managed a late scare from Purdue to hold on for a win but the same couldn’t be said for Ole Miss. They brought in Jacksonville State, I guess they figured these Gamecocks wouldn’t be as tough as South Carolina. They were wrong. JSU ran with the Rebels and won 49-48 after a successful two-point conversion in double OT. Oklahoma struggle with, but topped, Utah State 31-24. I think Landry Jones just needs a little time to settle in to the huge shoes Sam Bradford left for him. TCU stayed alive in their Cinderella-bid for a National Title after they held off Oregon State and LSU got a scare from a seriously depleted North Carolina team. I’m interested to see if UNC can bring it each week if they have numerous starters missing for the entire season. Of course, the crown jewel came today. 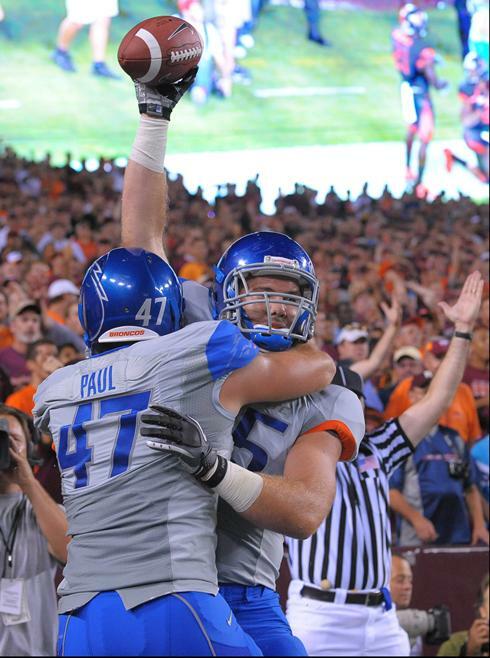 Boise State vs. Virginia Tech in Landover, Maryland. A virtual home game for the Hokies. This game was going to either legitimize or negate Boise State as a national contender. After five minutes it looked like the Broncos would be unstoppable this season. But, they came back to earth and the Hokies woke up. Tyrod Taylor, who looked lost in the first quarter started using his feet more and finding receivers. Of course, he was too inconsistent passing the ball for the full 60 which did hurt the Hokies. Kellen Moore found a way to lead Boise to victory after they leapt out to an early lead, just to fall into a slug fest with the ACC power. The 33-30 win shows that Boise is for real and are here to stay. Of course, that is a product of their schedule. So long as they survive Oregon State on the Smurf-turf in two weeks they will have a serious chance to back-door their way into the National Title. Lose to the Beavers, they are done. But, they can’t fall asleep through the remainder of their schedule either. If they beat Oregon State they will have little to no trouble staying third or better in the polls. They will need some help and might just get it from Miami this weekend. It is a long season that is always measured one play at a time. So Boise will have some serious work to do in two weeks when they face Oregon State. Just wait and see if we will see the Broncos in a serious National Title discussion soon.